A year after Russia sent it’s first female cosmonaut to the International Space Station (ISS), a group of six Russian women are currently undergoing an 8-day analogue mission to the Moon. The accomplished women, with expertise in backgrounds including biophysics and medicine, entered a suite of wood-panelled rooms on October 28 at Moscow’s Institute of Biomedical Problems to simulate the mission. The psychological effects of spaceflight are being tested, with a team of doctors and psychologists remotely monitoring the study. The institute has previously undertaken a 520 day isolation mock mission, Mars 500, in which 6 male candidates lived in similar conditions, simulating a mission to Mars. Another older analogue study with a mixed crew ended early after two male crewmembers fought and one male crewmember attempted to kiss a female crewmember. One of the most challenging parts of the all-female Russian mock mission may have occurred before it had even started, during the pre-study press conference. The institute’s director Igor Ushakov remarked, “We believe women might not only be no worse than men at performing certain tasks in space, but actually better.” His casual derogatory remarks continued with, “I’d like to wish you a lack of conflicts, even though they say that in one kitchen, two housewives find it hard to live together.” A potentially inspiring endeavour for women in space was unfortunately reduced to a sterotypical comparison of being a housewife and not being good enough for spaceflight. His remarks deepening the fact that a lack of self-confidence in one’s ability is an internal barrier that women battle around the world. When Canadian Space Agency (CSA) retired astronaut Dr.Julie Payette was asked what her biggest challenge in the pursuit of her goals, she admitted that it was “Fear and doubt I wouldn’t perform as needed.” Dr.Payette admitted that it had been her biggest challenge and it had taken a lengthy amount of time to convince herself that she was good for the job, even once she was selected and in training. The institute director’s remarks continued to set the tone for the press conference, where the 6 women, all experts in their fields, were asked by the press how they would cope without men or makeup for the next week. When the subject being inquired into moved to how they could possibly cope for 8 days without shampoo, the women sarcastically remarked back to the press, “I don’t know how we’ll survive without shampoo. Because even in this situation, we really want to stay looking pretty.” The media’s line of questioning is similar to that faced recently by cosmonaut Yelena Serova, Russia’s 4th cosmonaut(!) 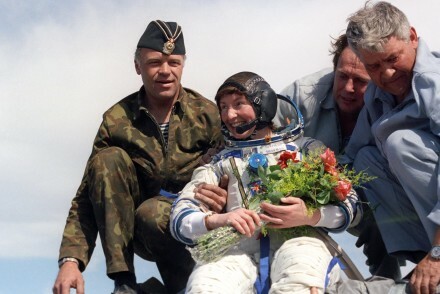 and the first female cosmonaut on the ISS. Yelena, an engineer with significant experience, was asked prior to her mission how she would style her hair in the microgravity conditions on the ISS and how she would continue to bond with her daughter during her 6-month mission. The then head of Russia’s space agency’s remarks about Yelena’s mission of, “We are doing this flight for Russia’s image. She will manage it, but the next woman won’t fly out soon.”, do little to inspire hope in the numbers of Russian women in space increasing in the near future. Though by choosing to conduct a study with 6 female candidates simulating a mission to the Moon, Russia will gain additional results that may help with this issue and hopefully inspire young Russian girls to realise that they can be a cosmonaut too. Happy Birthday to NASA Astronaut Sunita Williams!